Blues-Rocker Guitarist/Singer AC Myles Releases ‘Reconsider Me’! 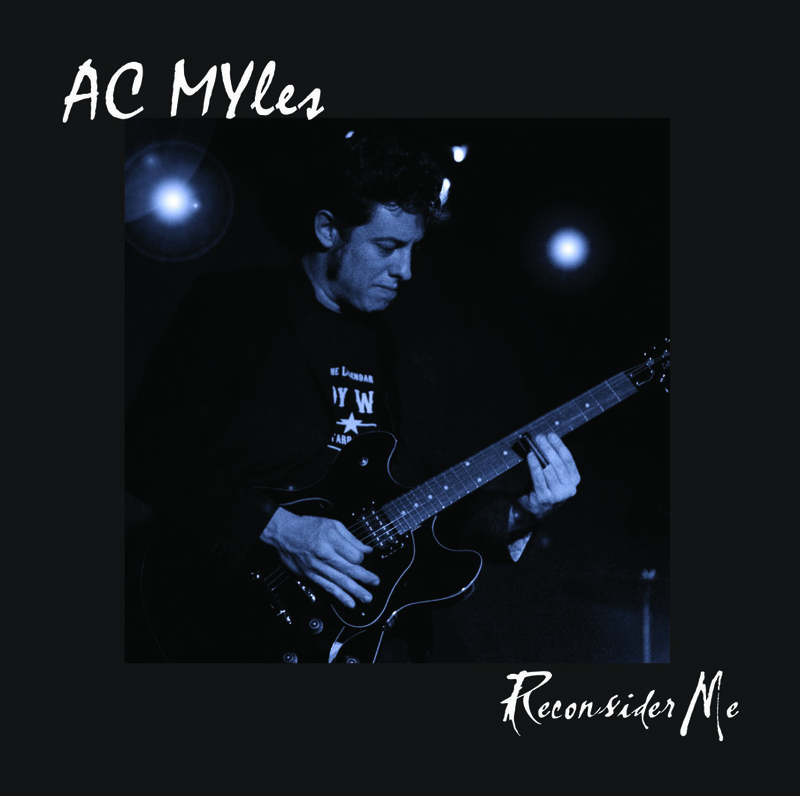 San Jose, CA – Blues-rocker guitarist/singer AC Myles’ new studio recording, ‘Reconsider Me’, groups songs that outline his musical development and his maturing into one of the more valid guitarist and vocalists in the blues arena. Recorded & produced in San Jose, CA. by Kid Andersen at his own Greaseland Studio, the album combines originals and choice covers to tell the roadworthy story of this well traveled and very talented Californian. With ‘Reconsider Me’, Myles very confidently delivers a “beyond amazing” vocal range, as well as his unyielding lead and slide guitar work. The song selections vary from traditional blues to 70’s blues-rock overload. With the opening track of the Jimmy Johnson inspired & Fenton Robinson penned “You Don’t Know What Love Is”, as well as the amazing vocal workout of the title track, Johnny Adams “Reconsider Me”, Myles proves his traditional stylings are up to snuff both vocally and on guitar. The self-penned tracks “Three Ways to Fall’’ and the tour de force “Livin’ a Lie” showcase fierce rock n roll slide guitar and vocal chops, following right in line with Rory Gallagher’s “Do You Read Me” and the co-written clever southern rocker “Call ’em All Baby”. Myles spent his later teens and twenties touring with his own band eventually finding his way to the San Francisco Bay Area, playing sideman to a wide array of acts, most notably blues man Fillmore Slim and modern day soul man John Nemeth. Along the way, with a keen ear and sincere passion, A.C. has become a gifted entertainer and musician. His personal appearances have a ‘take no prisoners’ approach which; along with a healthy dose of humor, usually gets even the toughest audiences on his side. In addition, ‘Reconsider Me’ features tracks by artists Myles has had the opportunity to share stages with in his career, including Elvin Bishop’s “Rock my Soul”, Roman Carter’s blues gem “Queen Bee”, and the Fillmore Slim funk arrangement of the Fats Domino R&B classic “Blue Monday”. The self-penned “Death Bed Blues”, which has a darker lyrical output and showcases his grasp and retention of blues traditions, while “What Is Love”, a cover of Oakland’s blues/mod/soul kings The Loved Ones, is an ode to the region of California that became adopted home territory for Myles and sprouted his musical growth and career. In support of ‘Reconsider Me’, AC Myles and his band have been touring throughout the summer with record release parties held in his home state of California in Los Angeles, San Francisco and Central California. Also added to AC’s official website is some great looking and sounding video of the live band. Festivals and club dates, as well as support to other acts, for 2015 for U.S. & Europe are currently being booked. AC also has begun to write the next untitled album, which should be ready for summer 2015 as well.